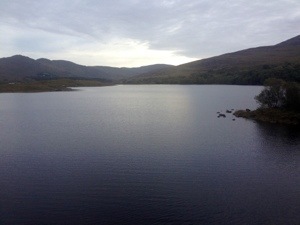 Another wonderful cycle route, it’s 12.30 and the sun is struggling to peek through the clouds. It is so much more enjoyable on a bike if the weather is likewise. I am seriously contemplating stripping off a layer of clothes. I am sitting at the Ardgroom (name of village) local store on the shoreline they offer a bowl of Ardgroom mussels for 6 Euro and throw in a glass of “organic” wine – all up 10 euro . A couple of Irish MAMILS have entered cafe, they are aiming for 80 miles. We bonded although so strong was their Irish brogue that at times I needed them to translate. The ride today is quite lovely with beautiful sea villages on the right then on the left tropical like forests of tracks and roads lined with rampant rhododendrons, holly bushes, wild fuchsia and stone fences covered in lichen, ferns and wild blackberry bushes. Nothing like stopping and sampling a wild blackberry. 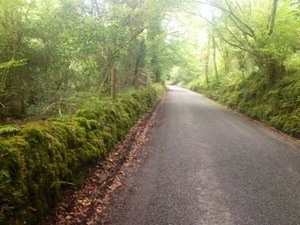 I took a brief side trip to the Glanmore Lake through shady narrow roads so green and overgrown, expecting a hobbit or leprechaun to suddenly dash across the road. The rain forests are very similar in many respects to our rain forests of parks such as the Otway Ranges, the major difference is the ambient temperature and the rather chilly breeze here in Ireland. 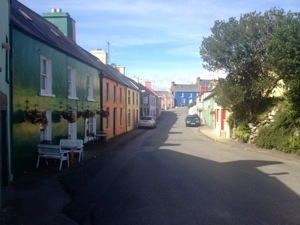 Stopped at Castletownbere for lunch – Chowder. My food philosophy has been to sample as much seafood as I can cause its obviously a fishing region and seafood restaurants are surpassed in number only by the pubs. The first chowder I tried had lots of seafood but the soup base much too thin. Today’s chowder much thicker, sadly thanks to cornflower. The label “home cooked soup” often is as valid as the labelling “made in Australia” when the product has been “assembled” but from imported parts. In the case of soup, it’s a dead give away of the use of a packet base when the soup has a distinct cornflower/arrowroot texture and all the diced “bits”, be it carrot, chicken, beef, bacon are uniformly 4mm cubes! The claim that it’s home made alludes to the extra bits of fresh whatever thrown in as it is heated up. My “home made” chowder was definitely of this type. I cycled 125 km today and the pinnacle, literally and figuratively was Healy Pass. The ascent was slow and gentle through alpine fields, similar to yesterday and with a moderate tail wind! Heaven. Then the panorama on each side was spellbinding. 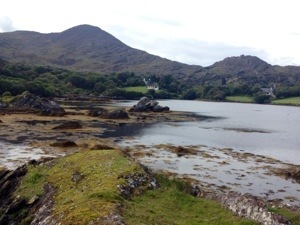 One looks from County Kerry on one side and County Cork on the other. Rather than use words, totally inadequate., hopefully a panorama or two may suffice. 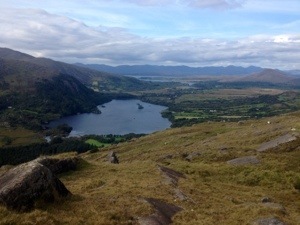 Then a descent, and final 20 km back to Kenmare and a cone of local ice-cream – chocolate and mocca!